With all of the beautiful hanging textile art I'd been seeing around blogland, I was itching for an excuse to try some out! So when my friend's birthday came along, and knowing she was loving the weaving trend too, well, I jumped at the chance. Luckily, my mom was into macrame in the late 70's and early 80's, so I had some books and pamphlets to go through and learn from. I found instructions for a wall hanging in Macrame Moods that I worked from, using jute, a piece of drift wood, a wooden embroidery hoop and some random bits of yarn (some cotton and acrylic) from my stash. Above are some pictures of the weaving in progress and the small god's eye that I also made to go with it. Of course I forgot to take a picture of the god's eye completely done, but I think I just added another row of the cream colored yarn to finish it off. The macrame knots were surprisingly easy and pretty fun. (There may be some macrame plant hangers in my future.) I did learn however, that because of the bit of bend that an embroidery hoop has, it makes creating a nice tight weaving pretty difficult. (The instructions called for a metal hoop which I didn't have.) The weaving part ended up a little loose, but since it's hanging I didn't think it was terribly noticeable. The god's eye was pretty fun as well, and made me feel like I was in summer camp! 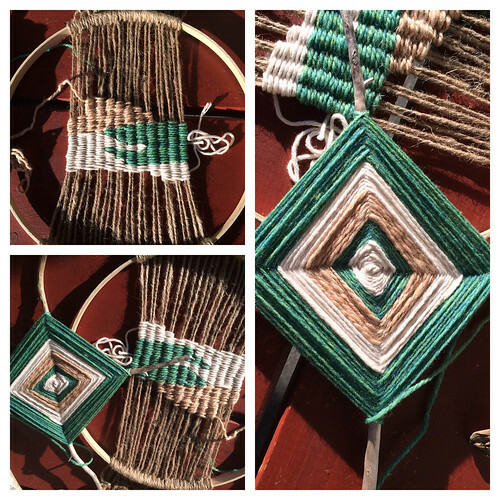 Have you guys played with macrame or weaving? Thanks Debi! It's pretty easy, I promise! I really like the god's eye. My children used to make them at school when they were little"
Love this! The colors are fantastic! 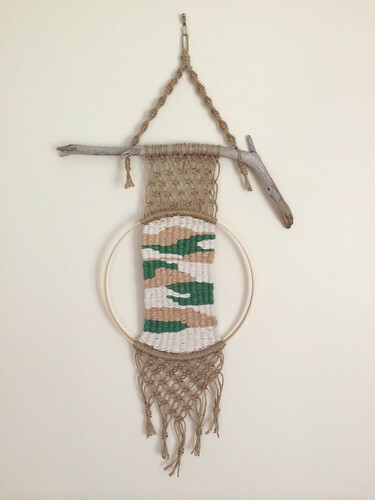 I would need a refresher on how to macramé but would love to make something!